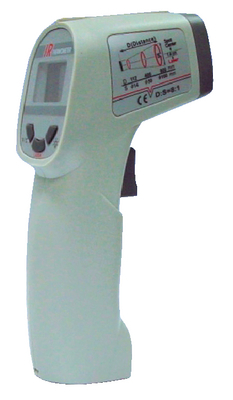 This precise, non-contact, infrared thermometer is ideal for measuring hot or moving objects. It offers a laser target pointer with bright backlight, a large digit display and a °F or°C measurement scale. Range of: -4° to 500°F (-20° to 260°C) with accuracy of 3%. The distance spot ratio measures area in a 1" diameter at a distance of 6". Response time is 500 m/sec. Weight: 6.3oz. Size: 6.25" x 3.11" x 2.25". Battery, carrying case and wrist strap included.